On April 8, 2019, Produce Packaging, Inc. announced its move to Willoughby Hills, where it will relocate its 300+ employees and $10 million payroll to the 155,000 square-foot former Sam's Club building in the Shoppes of Willoughby Hills (aka the old Loehmann's Plaza) later this year. Produce Packaging, Inc. was founded in 1994 and is now one of the largest produce packers in the region for restaurants and retail chains. By way of example, Sun Plum / Produce Place Market in Willoughby Hills is one of their current customers. Our Councilman John Plecnik, who serves as a tax professor at Cleveland State University, negotiated and drafted the tax abatement to help bring Produce Packaging and its 300+ jobs to Willoughby Hills. His tax abatement was unanimously adopted by Council and signed into law by the Mayor. Net of the tax abatement, Produce Packaging will generate an estimated $1 million of local income tax revenue over the next decade for Willoughby Hills. Councilman Plecnik also advocated for JobsOhio to support Produce Packaging, Inc. and their move to Willoughby Hills. On December 11, 2018, JobsOhio visited the old Sam's Club building, and Produce Packaging reached out to Councilman Plecnik for his help and support at the meeting. Councilman Plecnik was joined by his colleague Councilwoman Laura Pizmoht and his former student Peter Zahirsky, who serves as Director of Coastal Development for the Lake County Port & Economic Development Authority. Together with Gregory Fritz, the president and owner of Produce Packaging, they successfully advocated for JobsOhio to support bringing Produce Packaging, Inc. to Willoughby Hills! "Bringing Produce Packaging to Willoughby Hills was a team effort, and we are grateful to JobsOhio and Lake County, including their director of coastal development, Peter Zahirsky, for supporting us," Councilman Plecnik told The News-Herald. "We are also very grateful to the new owner of the Shoppes of Willoughby Hills, J. Scott Scheel, for working closely with the mayor and City Council to economically redevelop our business district." On March 28, 2019, Willoughby Hills City Council followed the recommendation of our Councilman John Plecnik and his Finance Committee to adopt a balanced budget for the fourth year in a row. The balanced budget increases funding for roads, funds the positions of three new full-time firefighters and substantially reduces the City debt. In fact, since Councilman Plecnik was first elected, we reduced the City debt by over $6.5 million or 40%. "The national debt is now over $22 trillion. That is twenty-two thousand, thousand, thousand, thousand dollars. Looking to Willoughby Hills, we have reduced our debt every year I have been in office. We need public servants with common sense, who understand that deficit spending, simply defined as spending more than you take in, is NOT sustainable," said Councilman Plecnik. "When I first ran for Council, I promised to vote against deficit spending and only support a balanced budget. This March, we passed a balanced budget yet again. I kept my promise, and I thank everyone on Council and in administration who worked so hard to make this possible!" On January 8, 2019, the Lake County YMCA joined our Councilman John Plecnik and his colleagues in breaking ground for the 2019 YMCA Dream House on the corner of Maplegrove Road and Maple Hill Road in Willoughby Hills. The Dream House is an annual fundraiser for the YMCA and its programs. Tickets will be sold to raffle off the residence. "Willoughby Hills is excited to welcome the YMCA Dream House to our community a second time," said Councilman Plecnik. "We are proud to support the YMCA, and so excited to welcome one very lucky resident to Willoughby Hills!" On October 25, 2018, Willoughby Hills City Council unanimously voted to adopt our Councilman John Plecnik's motion to bring a Police Substation to the Shoppes of Willoughby Hills, formerly known as Loehmann's Plaza, in the old bank building at 27701 Chardon Road. Councilman Plecnik personally met with the new owner of the Shoppes, local businessman and real estate developer J. Scott Scheel, along with Council President Nancy Fellows and former Council President Ray Somich to negotiate a rent-free lease for the City's new Police Substation over the next ten years. "Willoughby Hills is excited to work with Mr. Scheel in this public-private partnership to economically redevelop our business district," said Councilman Plecnik. "Council Leadership understands the need to create a business friendly environment in our City and aggressively recruit new businesses to Willoughby Hills. Earlier this year, I'm proud to share that Council followed the recommendation of my Finance Committee and voted to adopt my motion to grant a tax abatement to Hospice of the Western Reserve, Inc. That vote brought a $4.2 million payroll from Mentor to Willoughby Hills." Police Chief Chris Collins expressed his public support for the new Police Substation, emphasizing how the move would increase the operational effectiveness of his department and improve safety. "We thank our Police Chief, and we agree," added Councilman Plecnik. "Councilwoman Janet Majka and I both live a stone's throw from the Shoppes, and we share his sentiment that a Police Substation will make our neighborhood and the west side of Willoughby Hills safer for residents and businesses alike." On September 15, 2018, our Council President Nancy Fellows and Vice President John Plecnik officially kicked off the Willoughby Hills Fire Department's annual Touch-a-Truck by presenting our Firefighter Jill Baus and Acting Fire Chief Tim Serazin with a unanimous resolution of City Council thanking them for their hard work and special efforts in making Touch-a-Truck possible. Touch-a-Truck is a free event at City Hall and the Fire Department for children and families to see Fire, Police and Service vehicles up close along with music, hotdogs and ice cream. "In the past 15 years, Willoughby Hills Touch-a-Truck has become one of the most beloved family events in Lake County," said Councilman Plecnik. "We are so grateful to our Fire, Police and Service Departments for coming together every year to welcome our community." On June 21, 2018, the Supreme Court of the United States cited to the work of our Councilman John Plecnik, who serves as an Associate Professor of Law at the Cleveland-Marshall College of Law at Cleveland State University. Justice Sonia Sotomayor cited Councilman Plecnik's article, "Officers Under the Appointments Clause," 11 Pitt. Tax Rev. 201 (2014), in her dissenting opinion in the Supreme Court case of Lucia v. Securities and Exchange Commission. The majority held that Administrative Law Judges or ALJs at the SEC are "Officers of the United States" subject to the Appointments Clause, whereas Justice Sotomayor, joined by Justice Ginsburg, would have held such ALJs are mere employees. "It's the honor of a lifetime to see my work cited as authority in a Supreme Court opinion, and I am humbled," said Councilman Plecnik. "I thank Cleveland-Marshall and Cleveland State for supporting my research, and I look forward to continuing my work related to these types of Constitutional questions." in our City's history". See Ordinance 2018-33. On June 14, 2018, Willoughby Hills City Council joined our Council Members John Plecnik and Janet Majka to pass their proposal to CUT our sewer fees for the second time in two years. Under their first sewer fee cut in Ordinance 2017-6, the sewer fee hikes scheduled for 2017 and 2018 were cancelled, current sewer fee rates were rolled back to the old 2015 rates, and the minimum sewer charge was cut in half to benefit our seniors and anyone with low water usage. Under their second sewer fee cut in Ordinance 2018-33, current sewer fee rates are rolled back even further to the old 2014 rates, which translates to a nearly 15% reduction in the Willoughby Hills operating rate for our residents and business owners! LISTEN to our RADIO MESSAGE now! As heard on Newsradio WTAM 1100, Majic 105.7, and 96.5 Kiss FM. On March 22, 2018, Willoughby Hills City Council unanimously voted to adopt our Councilman John Plecnik's motion to grant a tax abatement to bring Hospice of the Western Reserve, Inc. and its $4.2 million payroll to Willoughby Hills. On February 14, 2018, our Councilman John Plecnik gave a guest lecture on the Tax Cuts and Jobs Act of 2017 and its affect on the middle class in Ohio to the members of the Lake County Retired Teachers Association at the Social Hall of St. John Vianney Church in Mentor. The Association is a chapter of the Ohio Retired Teachers Association and any teacher retired under the State Teachers Retirement System of Ohio, or out-of-state retirement systems, who lives in Lake County is eligible for membership. John is a tax professor and has taught at Georgetown University and Cleveland State University. On January 8, 2018, Willoughby Hills City Council met for its biennial organizational meeting and unanimously re-elected Councilman John Plecnik as Vice President of Council and Chair of the Finance Committee. "I'm very grateful for the confidence of my colleagues," said Councilman Plecnik. "And I'm also grateful to all of my neighbors in Willoughby Hills who have given us the chance to serve them." Visit the webpage of Willoughby Hills City Council to view all Members and their assignments. On Tuesday, November 7, 2017, Willoughby Hills re-elected its favorite son John Plecnik as our Councilman-at-Large. According to the Board of Elections, John not only won a third term, but was the top vote-getter in all of the contested races for Council. "I'm so grateful to my neighbors in Willoughby Hills for their confidence in me," said Councilman John Plecnik. "Thank you to everyone who trusted me with their vote, showed their support with a yard sign, sacrificed to donate, talked to their neighbors on my behalf, and beyond anything, believed in me. No one wins a campaign by themselves, and this victory belongs to all of us." In the past, Councilman Plecnik served as Chairman of the Willoughby Hills Recreation Commission and Vice President of the Board of Trustees for the Willoughby-Eastlake Public Library System. Today, Councilman Plecnik serves as Vice President of Council and Chair of Finance. "I love our home in Willoughby Hills and Northeast Ohio," said Councilman Plecnik. "Whatever my title, or even with no title at all, I'm just honored and thankful for the chance to serve my neighbors!" & World Premiere of "The Puppy Polka"
world premiere of The Puppy Polka! Councilman John Plecnik authored the lyrics of The Puppy Polka in honor of his own beloved puppy Bimmer, and he spent the past year working on the music with The Polka Pirates--the most-booked polka band in Cleveland. The Puppy Polka was simulcast on Facebook Live and uploaded to YouTube, and the video of its very first performance has already gone viral with thousands of views. Watch The Puppy Polka by Councilman John Plecnik and The Polka Pirates now! Plecnik Named Professor of the Year! On April 8, 2017, Councilman John Plecnik was named Professor of the Year at the Cleveland-Marshall College of Law at Cleveland State University. The award was announced to a packed house of students, alums, faculty and staff at the annual Cleveland-Marshall Barrister's Ball in the Music Box Supper Club. "I am overwhelmed and beyond grateful to serve," said Councilman Plecnik. "So many thanks to my students and Cleveland State for giving me the opportunity to guide the next generation of lawyers and leaders in Northeast Ohio." This marks the second time Councilman Plecnik was voted Professor of the Year by his students. He has won the award in 2012 and 2017. Neighbors Nominate Plecnik for Third Term! On March 24, 2017, Councilman John Plecnik filed his nominating petitions for Willoughby Hills Councilman-at-Large I with the Lake County Board of Elections. "Thank you to the dozens upon dozens of friends and neighbors who signed my petitions to nominate me for Willoughby Hills City Council!" said Councilman Plecnik. "With your help, I officially filed for a third term to bring Common Sense to City Hall. I truly believe that we will all win as a city this November!" The election is city-wide and will take place on Tuesday, November 7th, for a four-year term commencing on January 1, 2018. CSU Names Plecnik "Featured Researcher"
On February 14, 2017, the Office of Research at Cleveland State University named our Councilman John Plecnik, who also serves as an Associate Professor of Law, the "Featured Researcher" of the month for the whole university. The Office of Research also published a short video to highlight Councilman Plecnik's work to promote constitutionalism and fundamental fairness in our tax laws. Biggest Sewer Fee Cut in City History! On January 26, 2017, Willoughby Hills City Council joined our Council Members John Plecnik and Janet Majka to pass their proposal for the biggest sewer fee cut in City history. Under Ordinance 2017-6, the sewer fee hikes scheduled for 2017 and 2018 are cancelled, current sewer fee rates are rolled back to the old 2015 rates, and the minimum sewer charge is cut in half to benefit our seniors and anyone with low water usage. and taxes . . ." That year, Councilwoman Janet Majka joined Councilman Plecnik in going door-to-door and campaigning shoulder-to-shoulder for lower sewer fees. If elected, they publicly pledged their vote to repeal the sewer fee hikes scheduled for 2016, 2017 and 2018. With strong support from Council President Nancy Fellows and Councilman David Fiebig, Council Members Majka and Plecnik kept their promise to us! You can read more about "the biggest sewer fee cut in the history of Willoughby Hills" in The News-Herald, which published "Willoughby Hills residents will see reduced sewer rates" on January 31, 2017.
our Councilman John Plecnik at his Campaign Kickoff for a third term on Council! On November 12, 2016, Willoughby Hills City Council joined our Councilman John Plecnik in unanimously voting to adopt raises for our part-time police and firefighters as well as our police chief for the first time in two years. As Chairman of the Personnel Relations Committee, which considers all relations with City employees, Councilman Plecnik is an strong advocate for the hardworking women and men of our safety forces. "The modest 3% raise that Council adopted on the unanimous recommendation of the Personnel Relations Committee is roughly equivalent to the raises received by our full-timers over the same period of years," said Councilman Plecnik. "And I believe that part-time police and firefighters--who do the same work and put their lives on the line the same way--deserve the same raise." You can read a full copy of Ordinance No. 2016-52 (P-T Police), Ordinance No. 2016-53 (P-T Fire), and Ordinance No. 2016-54 (Police Chief) to learn more. On May 12, 2016, Willoughby Hills City Council joined our Councilman John Plecnik in unanimously voting to adopt OHIOCHECKBOOK.com to publish our City finances, right down to the individual checks, in a searchable, online format. "Transparency is so important to good government," said Councilman Plecnik. "To quote the late Justice Louis Brandeis, 'Sunshine is said to be the best of disinfectants.'" As Chairman of the Finance Committee, our Councilman John Plecnik shepherded through the first balanced budget in years, and continues to fight for fiscal responsibility and transparency with the adoption of Ohio Checkbook. CSU Graduate Student News, the official newsletter of the College of Graduate Studies, interviewed our Councilman John Plecnik for the lead story in its April/May issue on his promotion to Interim Associate Dean as well as his path to teaching and public service. You can read the newsletter or Councilman Plecnik's interview to learn more about CSU and one of its most beloved professors. In addition to serving us in Willoughby Hills, our Councilman John Plecnik is a leader at Cleveland State University, where he teaches taxation and estate planning as an Associate Professor of Law. As of February 22, 2016, Cleveland State University has appointed Councilman Plecnik as Interim Associate Dean of the College of Graduate Studies. "I am excited and grateful for the chance to serve Cleveland State University and our students in a new capacity," said Councilman Plecnik. "And I am honored to work as Interim Associate Dean for however long I am needed." Prior to his appointment as Interim Associate Dean, Councilman Plecnik was voted Professor of the Year at the College of Law in 2012, won the Golden Apple Award from the Alumni Association in 2015, and was named Co-Chair of the 2015 Faculty & Staff Campaign, which raised hundreds of thousands of dollars for student scholarships. On April 5, 2016, Cleveland.com featured a Q&A with our Councilman John Plecnik as part of an article on Millennials who serve Northeast Ohio in public office. Entitled "Millennials in office: A new generation of politics and public service," Michael McIntyre's article highlights officeholders under the age of thirty-five and asks them about their generation's perspective on public service. In his interview, Councilman Plecnik expressed hope that Millennials will bring a "fresh approach" to public service with "more focus on balancing our budget, dealing with the national debt, and creating a sustainable plan for America's future." On March 10, 2016, Willoughby Hills City Council voted to adopt a balanced budget for the first time in years. As Chairman of the Finance Committee, which oversees the budget, our Councilman John Plecnik led the charge against deficit spending. "This year, the national debt hit $19 trillion. That is nineteen thousand, thousand, thousand, thousand dollars. Looking to Willoughby Hills, the city debt is over $12 million. We need public servants with common sense, who understand that deficit spending, simply defined as spending more than you take in, is NOT sustainable," said Councilman Plecnik. "When I first ran for Council, I promised to vote against deficit spending. This March, for the first time in years, Willoughby Hills passed a balanced budget. On March 3, 2016, our Councilman John Plecnik gave a guest lecture on the role of local government in tax law and economic development to the students at the Willoughby-Eastlake School of Innovation in Willoughby Hills, which is a STEM school for gifted students. On January 4, 2016, Willoughby Hills City Council met for its biennial organizational meeting and elected Councilman John Plecnik as Council Vice President and Chair of the Finance Committee, which oversees "[a]ll matters concerning and affecting revenues of the City including, but without limiting the generality of the foregoing, the receipt and expenditure of funds, salaries of City employees, budgetary matters, tax administration and policy and matters concerning Municipal indebtedness." Councilwoman Nancy Fellows, the longest-serving elected official in Willoughby Hills, was elected as Council President. "I am honored to serve," said Councilman Plecnik. "And I look forward to working with our new Council President Nancy Fellows. Together, there is so much good we can do for our neighbors in Willoughby Hills!" Councilman Plecnik was sworn in for his second term as our Councilman-at-Large on January 1, 2016, by the Honorable Judge Mark Bartolotta of the Lake County Probate Court. He won re-election with 58% of the vote and was the top vote-getter in Willoughby Hills. John Plecnik Re-elected in Landslide! On Tuesday, November 3rd, Willoughby Hills re-elected its favorite son John Plecnik as our Councilman-at-Large by a whopping 58% to 42% margin. According to the Lake County Board of Elections, John not only won in a landslide, but received more votes than any other candidate for Council or Mayor in the City of Willoughby Hills. "I am overwhelmed by the outpouring of support by my friends and neighbors in Willoughby Hills," said Councilman John Plecnik. "We worked very hard for this win--my family, my volunteers--but we never expected to be the top vote-getter in Willoughby Hills. Thank you to everyone who trusted me with their vote, showed their support with a yard sign, sacrificed to donate to my campaign, and more than anything, believed in me. No one wins a city-wide race by themselves, and so many people campaigned their hearts out for this victory. Common sense is not so common, especially with politicians. That is why I stepped up to serve on Council two years ago, and that is why I ran again this year. We need common sense in City Hall, and with your help, we will move Willoughby Hills forward in a positive direction!" As heard on Newsradio WTAM 1100 and 96.5 Kiss FM. On September 21, 2015, our Councilman John Plecnik received the Golden Apple Award from the Cleveland State University Alumni Association in recognition of his "exceptional contribution" to the lives of his students. In addition to serving as our Councilman-at-Large for the City of Willoughby Hills, John is an Associate Professor of Law at Cleveland State University, where he teaches taxation and estate planning. On June 11, 2015, without a single dissenting vote, Council passed Councilman John Plecnik's resolution against exempting single engine planes from noise abatement at the Cuyahoga County Airport. The resolution also reiterates our city's opposition to airport expansion. On July 9, 2015, Councilman Plecnik personally delivered his resolution to the Noise Abatement Council of the Cuyahoga County Airport, and the planned vote on the exemption from noise abatement was delayed for more consideration. The next meeting of the Noise Abatement Council is October 8, 10:00 a.m., at the Airport, Conference Room, Area B, and is open to the public. In the second quarter of 2015, 117 aircraft complaints were filed with the Airport, 98 of which were from Willoughby Hills. You can read a full copy of Resolution 2015-5 against airport noise to learn more. Our Councilman John Plecnik kept his promise to vote against deficit spending and only support a balanced budget for Willoughby Hills. On March 27th and March 31st, the administration twice proposed the exact same deficit budget, which included more than half a million dollars of deficit spending and yet another raise for City Hall. On both dates, Councilman Plecnik listened to you and voted NO. "When I first ran for Council two years ago, I promised to vote for balance and against deficit spending," said Councilman Plecnik. "I keep my promises. Willoughby Hills needs a balanced budget. We cannot cut our Roads, Police or Fire anymore without compromising the safety of our residents and neighbors. We cannot raise taxes or sewer fees again, after raising them in 2010 and 2013, respectively. Our only fiscally responsible option is to cut administration and overhead, and over the past year, I proposed very specific cuts that would balance our budget. Unfortunately, the administration seemed to ignore my proposals, and repeatedly put forward the exact same deficit budget with no changes or compromise. We need a Council and Mayor who can compromise and work together to move Willoughby Hills forward in a positive direction. Although it was undeniably a step in the wrong direction when the deficit budget passed by one vote, I prefer to focus on the positive. If my neighbors send me back to Council on November 3rd with just one more fiscally responsible Council Member, we can finally balance our budget next year and for years to come!" On March 27th, the deficit budget failed in a 3-3 tie. On March 31st, the deficit budget was passed in a 4-3 vote with Councilman Plecnik voting against it. Go to the front page of The News-Herald to read more. Our Councilman John Plecnik serves as a law professor at Cleveland State University, where he was named Co-Chair of the 2015 Faculty & Staff Campaign. The campaign was university-wide, and raised hundreds of thousands of dollars for scholarships for the more than 17,000 students who attend CSU. "After Co-Chairing the Faculty & Staff Campaign for the College of Law for the past two years, I am honored to serve as Co-Chair for the whole of Cleveland State University," said Councilman Plecnik. "With your help, and the help of my Co-Chair Jillian Keller, Coordinator for the Mareyjoyce Green Women's Center & Viking Food Pantry, we have the chance to make a real difference in the lives of our students." You can listen to John's appeal to faculty and staff or learn more and donate online. to WH City Council this November 3rd! 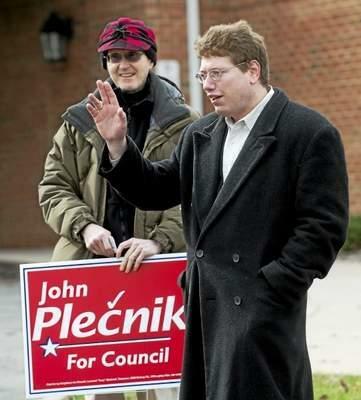 On March 3, 2015, Councilman John Plecnik filed his re-election petitions for Willoughby Hills Councilman-at-Large IV with the Lake County Board of Elections. "Thanks to dozens of my friends and neighbors in Willoughby Hills for taking the time to sign my re-election petitions," said John Plecnik. "Your vote of confidence means the world to me." "With your help, I officially filed for re-election to Willoughby Hills City Council this morning. I truly believe that we will all win as a City this November!" The election is city-wide and will take place on Tuesday, November 3rd, for a two-year term commencing on January 1, 2016. On February 12, 2015, Willoughby Hills City Council voted to appoint John Plecnik our new Council Representative to the Noise Abatement Council for the Cuyahoga County Airport. "To say that I am your representative on the Noise Abatement Council is just a long way of saying that it is my job to represent your concerns to the Cuyahoga County Airport," said John Plecnik. "As someone who lives close by the airport on Bishop Road, I understand two things. First, NO airport expansion. And second, so long as the airport is our neighbor, it needs to be a good neighbor. I believe that the airport can do a better job of managing flight paths to reduce noise pollution in our neighborhood. I will work hard to hold the airport accountable. It needs to keep its promises to minimize noise and maximize safety." Go to the Noise Abatement Council's website to read more. On January 30, 2015, John Plecnik coached the student team from Cleveland-Marshall College of Law at Cleveland State University to 3rd Place and Best Written Submission in the American Bar Association Law Student Tax Challenge, the largest and most prestigious tax competition in the United States. Go to Cleveland State University's News & Announcements to read more. On September 19, 2014, John Plecnik spoke on tax policy at the 2014 Joint Fall CLE Meeting of the American Bar Association Section of Taxation in Denver, Colorado. John was invited to speak as a result of his article, "The New Flat Tax," which ranked number one as the most downloaded recent tax paper on the Social Science Research Network shortly after its publication in the Hastings Constitutional Law Quarterly this spring. John spoke as part of a panel on wealth taxation and the Apportionment Clause of the U.S. Constitution. John's panel was hosted by the ABA Tax Policy and Simplification Committee. It was moderated by Roger Royse of the Royse Law Firm PC, and included Professor Alice Abreu of Temple University Beasley School of Law, Diana Furchtgott-Roth of the Manhattan Institute for Policy Research, and Professor Richard Lavoie of the University of Akron School of Law. Councilman David Fiebig introduces Councilman John Plecnik to a packed house! Our Councilman John Plecnik delivers his state of the city address to over 150 supporters in the Willoughby Hills Community Center! On June 10, 2014, The News-Herald published Councilman John Plecnik's guest column entitled, "Three-reading rule explanation." The three-reading rule requires legislation to be “read” or considered three times prior to a vote. The U.S. Senate and House, Ohio General Assembly, and Ohio municipalities all embrace some version of the rule. However, the rule is far older than Ohio or even the United States. The Canadian Parliament, which also follows the rule, traces its source back to 15th and 16th century England, when it became the usual practice for the House of Commons. However, multiple-reading rules are older still. In the Reforms of 403 B.C., the Athenian Assembly adopted a two-reading rule, whereby each ordinance was read, then posted in the marketplace, and then read a second time prior to a vote. Athens learned about the dangers of rash legislation the hard way. In 406 B.C. during the Peloponnesian War, the Athenian generals failed to rescue their drowning sailors from the Spartan navy. Over Socrates’s objection, the Athenian Assembly immediately voted to execute their generals. Of course, without their generals, the Athenians soon lost the war. Realizing their mistake, the Athenians adopted their two-reading rule. Today, the three-reading rule is oft-criticized as inefficient. In emergencies, most versions of the rule allow waiver by super-majority vote. Critics waive the rule in most cases. In fact, a survey by the Northeast Ohio Media Group shows that many Cleveland suburbs waive the rule nearly 90% of the time. Before my election, Willoughby Hills also waived the rule in most cases. Why object to waiver? It might be more efficient to have a dictator, king, tyrant or mayor make all of our decisions. But government is not a business and efficiency is secondary to fairness. The three-reading rule is an ancient right of the people to a deliberative process and to participate in all the workings of their legislature. But why would your council wish to stifle argument? Sometimes, in the words of Professor Lawrence Keller of Cleveland State University, it is simply “sloppy government.” Some councils are too lazy for three readings. Sometimes, however, there is a more sinister reason. In Willoughby Hills, our first major legislation of the year was passing appropriations for road and sewer projects. Three council members, myself included, insisted on following the three-reading rule. In response, another council member claimed the service superintendant told him—absent immediate action—a dangerous sinkhole could develop on SOM Center Road. By the third reading, we learned there was no immediate danger of a sink hole. Worse still, we learned that the same member who warned of a sinkhole voted on similar appropriations for years that were ultimately paid to a company named Landco. Public records show that Landco was not only the member’s employer, but owned by his parents. Had council voted immediately, in all likelihood, more city money would have been paid to Landco before these revelations. Some may say things have changed since the dawn the democracy, and modern technology obviates the need for three readings. But the internet is no substitute for deliberation or confronting your council members face-to-face. The three-reading rule has stood the test of time for good reason. On Friday, January 3rd, John Plecnik took the oath of office for Councilman-at-Large for the City of Willoughby Hills. "I can never thank everyone enough, but I'll try my best to repay you with my hard work," said John. "You can count on two things from me in the coming years. I'll always be honest, and I will be fiscally responsible." Judge Mark Bartolotta of the Lake County Probate Court administered the oath to John as well as Councilman-at-Large David Fiebig, Councilwoman-at-Large Nancy Fellows, and District 3 Councilman Chris Hallum. Rick Motuza, former Chairman of the Recreation Commission, served as master of ceremonies. The members of VFW Post 4358 led the pledge of allegiance, Father George Smiga of St. Noel gave the invocation, and the Mi Smo Mi Slovenian chorus sang the national anthem. Willoughby Hills City Hall was packed with over 100 attendees, including current and former Willoughby Hills Mayors and Council Members, State Representative Ron Young, State Board of Education Member Sarah Fowler, Willoughby-Eastlake School Board Member Amy Zuren, Richmond Heights Mayor Miesha Headen, Eastlake Councilwoman Cindy Quinn-Hopkins, and former Lake County Commissioner Dale Fellows. Allow me to express my warmest congratulations on your recent election as City Councilman of Willoughby Hills! As a Minister for Slovenians Abroad, I feel proud to learn that a descendant of Slovenian immigrants acts on such an important position as yours. Thank you for everything you did in your past function, also for Slovenian Community in Willoughby Hills and broader Cleveland area. Please accept my best wishes for your successful work! On Tuesday, November 5th, Willoughby Hills elected John Plecnik as your newest Councilman-at-Large. Among many others, Congressman Dave Joyce congratulated John at his election night victory party in the Willoughby Hills VFW, and Governor John Kasich added his congratulations with a personal phone call two days later. "I am honored to serve my home--I am honored to serve my neighbors in Willoughby Hills," said John Plecnik. "I cannot thank you all enough, but I promise to work hard for you on Council!" As your Councilman-at-Large, John will represent the entire City as one of seven Members of Council. Of those seven, four serve as at-Large Members, and three represent one third of the City as District Members. ﻿Vote Experience!﻿ Vote John Plecnik on Nov. 5! Welcome to our website! Thank you for taking the time to learn more about your neighbor, John Plecnik, the experienced and fiscally responsible candidate for Willoughby Hills City Council. John is determined to bring fresh blood and an independent voice to City Hall. Like a board of directors or trustees overseeing a CEO, Council must be independent of the Mayor. John understands that. He will work with the Mayor, not for the Mayor. He will REPRESENT YOU and ONLY YOU with the same zeal that a lawyer represents his client. John is the only candidate with actual experience managing a multi-million dollar government budget, and the only candidate with degrees in accounting, law, and taxation. He wants to bring that experience and education to the table to balance our budget without cutting critical services or raising taxes. We need someone who is READY to SERVE on day one! We need to elect John Plecnik to Willoughby Hills City Council on Tuesday, November 5th! John's two cases in U.S. Tax Court both settled on terms favorable to his clients. John Plecnik, a law professor at the Cleveland-Marshall College of Law at Cleveland State University, was quoted in Tax Notes Today, the premier news source for tax issues in the United States. The quote was in regard to two cases in U.S. Tax Court that John is co-counseling pro bono with Cleveland Legal Aid. Both cases involve the so-called Earned Income Tax Credit (EITC) ban under section 32(k) of the Internal Revenue Code. Plecnik said one might be left with the impression that there is no standard at all for imposing the ban on taxpayers, adding that he thinks the IRS is using the dictionary definitions of reckless or intentional disregard. However, the legislative history for section 32(k), in which the ban can be found, shows that section 6662, which does have a clear definition of reckless or intentional disregard, was referenced in relation to section 32(k), he said. "I think that the correct definition is best laid out in the regulations to 6662, where disregard is reckless if the taxpayer makes little or no effort to determine whether a rule or regulation exists under circumstances which demonstrate a substantial deviation from the standard of conduct that a reasonable person would observe," Plecnik said. "There are tons of cases dealing with when it's appropriate to apply 6662 penalties, and they typically don't apply where someone goes to a return preparer in good faith, essentially does their best, and says, 'Hey, I'm paying you, get it done,' and gives them all the information as best they can." Plecnik said that under the section 6662 standards, it's clear [his client] acted in good faith and that those rules should be applied to section 32(k). "Otherwise we're left with the current setting where the IRS just says well, does it feel reckless or not?" he said. John Plecnik hosted his first annual "Slovenian Style" Dinner to kick off his campaign for Willoughby Hills City Council on June 12, 2013 in the Willoughby Hills Community Center. With over 150 attendees and thousands of dollars raised, the "Slovenian Style" Dinner was the biggest fundraiser for a municipal candidate in the history of Willoughby Hills. Councilman David Fiebig of Willoughby Hills introduced John as a "good man" and "rising star," and left the podium saying "John is going to serve on City Council. We're sure of it!" John addressed the packed room with gratitude. "I have to thank you all for joining us today. When we decided to have our event in the Community Center, never in a million years did we think that so many of our friends, our neighbors, my colleagues, even my family would be able to join us today. I really am overwhelmed by your support. I know it's not easy to take time out of your day, it's not easy to contribute, but to have so many of you here with me means the world. Beyond any City Council race, I am grateful for you all being here." In addition to Councilman David Fiebig, Councilwoman Nancy Fellows, Councilman Kevin Malecek, Councilwoman Cindy Quinn-Hopkins, Councilman Bob Patton, Library Trustee Dave Kayser, and the Consul General of Slovenia, Jure Zmauc, were in attendance. After the "Slovenian Style" Dinner, John was interviewed by Tony Petkovsek of WELW radio and Paul Lavrisha of WKTX radio, about the dinner's record-breaking turnout. Those shows aired the following Saturday. John Plecnik circulated petitions for City Council throughout March at the annual Willoughby Hills Pancake Breakfasts. While greeting residents and patrons with a fresh pot of coffee, John discussed his plan for City Council in 2014 and beyond. "Serving Willoughby Hills as Chairman of the Recreation Commission, which sponsors most of our city events, has been an incredible experience. I would be honored to continue my service as a member of City Council." John also serves as Vice President of the Library Board of Trustees for the Willoughby-Eastlake Public Library System. He said, "I am sensitive to the needs of the library district and respectful of the taxpayer's investment. I plan to bring that fiscally responsible approach to City Council here in Willoughby Hills." On March 19, 2013, John filed his petitions for Willoughby Hills Councilman-At-Large IV. The election is city-wide and will take place this November 5th for a two-year term commencing on January 1, 2014.